STEELERS 2014 MVP: “Le’Veon Bell”! | "IT'S A STEELERS WORLD"! 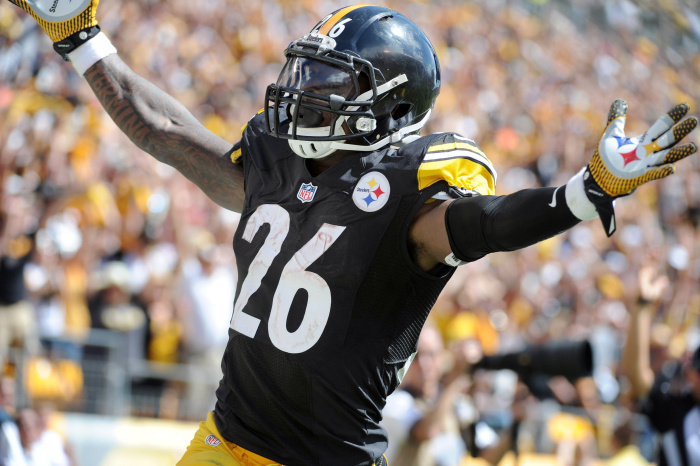 STEELERS 2014 MVP: “Le’Veon Bell”! Steelers running back Le’Veon Bell was recognized for his outstanding play today by his teammates, who voted him the team’s 2014 Most Valuable Player. It is the first time Bell has received the award and the seventh occasion in team history that a running back was named Steelers MVP. Bell is the first running back since 2006 (Willie Parker) to be named team MVP. Bell has established himself as one of the best running backs in team history in just his second season. His 2,115 yards from scrimmage is a new single-season franchise record, and his 77 receptions for 774 yards are also single-season team records for running backs. Bell has totaled 11 touchdowns (eight rushing, three receiving) on the season. Currently, Bell has rushed for 1,341 yards on the season, which is good for second in the NFL and is tied for fifth on the team’s all-time single-season rushing yards list. He is one of four players in NFL history to record at least 1,300 rushing yards and 750 receiving yards in the same season (Marshall Faulk, Steven Jackson and Brian Westbrook). Earlier this season, Bell recorded 200 yards from scrimmage in three straight games to join Walter Payton (1977) as just the second player in league history to accomplish that feat. Since making his NFL debut Week Four of the 2013 season, Bell leads the NFL with 3,374 yards from scrimmage. 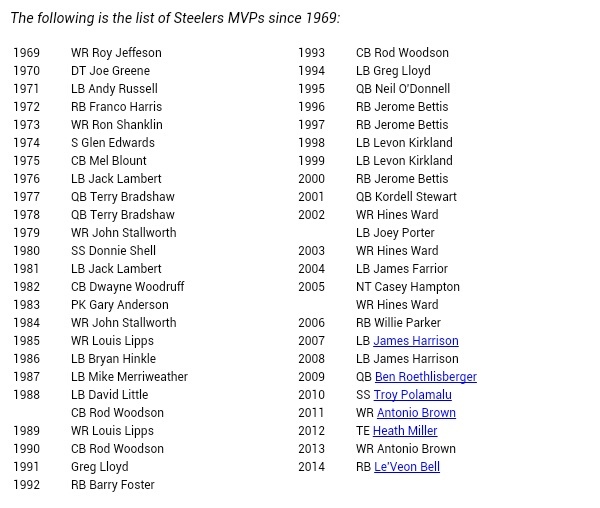 Bell’s Steelers MVP honors come one year after he was honored with the Joe Greene Great Performance Award, given annually to the team’s top rookie.